I have a BEAUTIFUL polish to show off today! Rescue Beauty Lounge is an amazing brand of nail polish. Aqua Lily was a part of the Spring 2012 Fan Collection- Ji (the creator) allowed fans from all over to submit their dream polish ideas, and the winning ideas were brought to life. Aqua Lily was a huge fan favorite, and sold out quickly. It was so popular that Ji opted to included it in this year’s Bring It Back collection, so soon after it’s initial release. I JUMPED at the chance to own Aqua Lily this time. I was new to the polish world when the collection was initially released, and my lack of knowledge combined with sticker shock (RBL polishes are $20 each) lead me to wait too long to buy it. I also did this with Scrangie (another well loved RBL that Ji has said will never be returning)- but thankfully I managed to get my hands on it via a swap. I’ve learned my lesson- if I ADORE it and it’s not a core color, I need to save up and get it. This color is a dream to apply. It went on smoothly, required no cleanup, and was fully opaque in 2 coats. These photos are 2 coats of Aqua Lily and 1 coat of Julep Fast Dry Topcoat. Just look at that beautiful shine of pink! 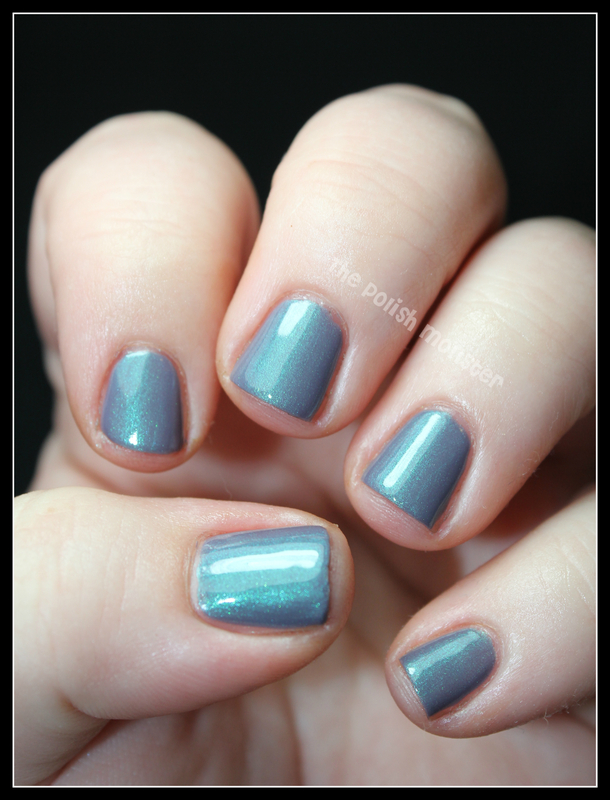 Indoors, Aqua Lily doesn’t quite shimmer on the nails like it does in the bottle. It’s much more subtle. If you really want Aqua Lily, I highly suggest saving up and getting it while you still can! Rescue Beauty Lounge polishes are $20, and can be found here. You can also follow the RBL Facebook page here. 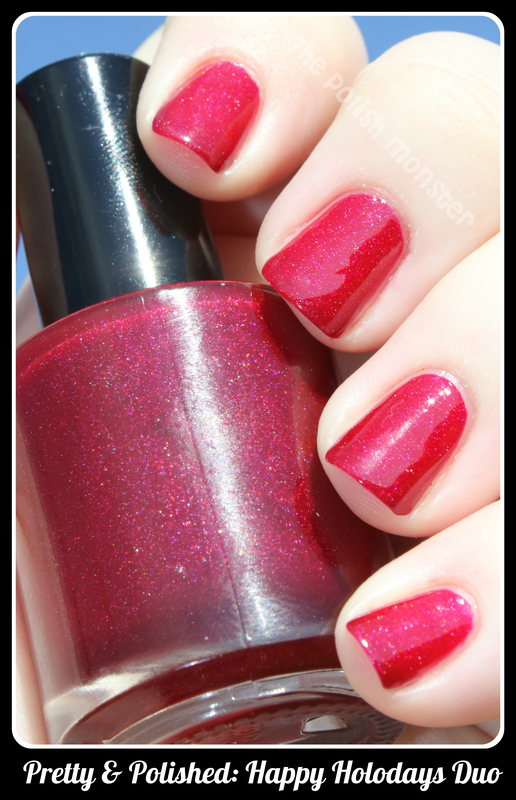 Model City Polish: Christmas Collection swatches and review! Well, today was sunny and beautiful, so I had great sunshine for photos! As promised, I have some fun Christmas polishes to show you (sometimes I use a lightbox, but these didn’t want to cooperate inside). We’re in the process of putting up our tree and decorating here- I adore this time of year! Tonight I have some of the colors from Model City Polishes Christmas Collection: O Christmas Tree, Silver and Gold, and You’re A Mean One. First up, I have O Christmas Tree! This is a fun polish, filled with green shards, gold stars, silver bar glitter, and a variety of multi colored hex glitter! Everything you’d imagine on a Christmas tree 🙂 This polish applied well- I chose to use the dabbing method to apply it exactly where I wanted it. I layered 1 coat of O Christmas Tree over 2 coats of OPI Just Spotted The Lizard. Next up is the Silver and Gold duo! I’ll start off with Silver. Silver and Gold is made up of 2 polishes- a silver glitter topcoat, and a gold glitter topcoat. Both are filled up with multiple sizes of hexes and bar glitter. Again, I chose to dab to apply where I wanted. This one was a bit tricky to work with, but it didn’t take long to have everything where I wanted it. I layered 1 coat of Silver over 2 coats of China Glaze For Audrey. And now for the gold part of the duo! Like Silver, Gold is made up of multiple sizes of metallic gold hexes and bar glitter. This one was the most tricky of the bunch- the bar glitter has a bit of a curve to it (though topcoat helps smooth it down), and I definitely had to dab to place everything just so. Out in the sun, this was very stunning! I love wearing gold on my nails. It was a beautiful counterpart to my base color- 365 Day’s of Color’s Mrs. Claus (which will be shown off all on its own in a few days!). Last but not least, we have my favorite- You’re A Mean One! This is a fun glitter topcoat filled with green squares, silver hexes and bright red hearts. Again, I dabbed the glitter on for placement. What I loved about this one was that I never once had to fish for hearts- what you see is what came out! I think I had to put a few BACK one time! This is 1 coat of You’re A Mean One over 2 coats of OPI Just Spotted the Lizard (which makes for a great undie coat for these Christmas colors!). Overall, I really like this collection. The glitters can definitely be a bit tricky with placement and things of that nature, so these are better suited for us ladies (or guys!) that love glitter and are used to dealing with the challenges they can sometimes come with- though it doesn’t take much longer using the dabbing method, just a bit more patience! And I really encourage everyone to check out the store- there are some other AMAZING colors in this collection! I just adore Spearmint and Sugar Plum, and Cookies and Milk is such fun! You can find Model City polish on Facebook here, and you can buy all of the Christmas collection and more here at the Etsy store! Happy Thanksgiving to all of my readers here in the US, and to anyone else that may be celebrating today! One of the many things I am thankful for is all of YOU! My husband pushed me and pushed me to just start a blog to have a fun way to show off my collection, and I never thought so many people would be even remotely interested in looking at my chubby nubbin’ nails 🙂 So thank you! Speaking of nubbin’ nails… mine have made a reappearance again 😦 I had finally recovered from my last break, when I got a small tear at my nail bed line on my swatching hand’s index finger. I tried to repair it, but I had waited too late (it happened when I was out) so the nail just had to be cut. Back to square one! You’ll probably notice for about a week that particular finger is uneven- I refused to cut the entire nail that far down, so one edge is a bit shorter than the other (that’s where the break happened). Truth be told, I prefer my nails this short in terms of function- with how much running around and housework I do, maintaining longer nails is hard. But I love LOOKING at my nails when they’re long! ‘Vibrant teal shimmer’ is a VERY good description here. This shimmer is very, very noticeable. It’s not one that only comes out to play in sunlight- it’s just as beautiful and visible in the shade and indoors. Application was amazing. I rarely use the phrase ‘applied like butter’, but that’s really how this applied. The polish is a bit on the thicker side, but it goes exactly where you want it to- no flooding, no other issues. It even appeared to self level a bit! This is 2 coats of Wanderlust followed by 1 coat of Color Club topcoat. I could have gotten away with 1 coat, but I did 2 since I was going to photograph. Close up photo of one of my nails! I could probably rave forever about these polishes. Though I didn’t photograph it, I wore ‘We’re All Mad Here’, one of her holiday colors, just yesterday and it took my breath away. All Takko Lacquer polishes are 3-Free, made in the USA (all the ingredients, pigments, base, bottles, labels, from the boxes and bubble wrap are USA made), vegan, cruelty free, and mineral based. You can follow Takko Lacquer’s blog here to keep up to date on new polishes and news, and follow them on Twitter here (@takkolacquer). You can buy these beautiful colors at Takko Lacquer’s Etsy store here. Polishes sell for $15. I know that’s a bit higher than a lot of girls are comfortable spending- but trust me, they are worth every penny. They’re worth saving for! Restocks typically happen on Fridays at 1pm EST. If you want something, though, be sure to be there when she opens! There’s usually only a few of each color and things move pretty quickly (though not so fast you want to throw your computer out a window). Hey all! I haven’t been able to swatch the whole collection as planned (I still hope to by tomorrow- and I had to cut down to nubbins again), but I did want to let anyone know that may have missed the Facebook message that I’m running a giveaway right now! Rules are fairly straightforward, like normal- you have to like the Facebook page, and you have the option to follow me on Twitter. Open internationally! The prize is all 4 polishes from the Essence: Breaking Dawn Part 2 collection! While I don’t post more than a few times a week, I do apologize for being mostly absent from blogging and Facebook this past week. My entire family has been down with RSV, and it’s affected my 2 year old the most severely (breathing treatments, etc) followed by myself (I have asthma so all chest colds hit me a bit hard). I think we’re on the mend, but it’s been a rough week. As a break from all that, I finally got a chance to swatch these beautiful colors from the Santa Baby collection from Different Dimension, and I can’t wait to show them off! I have ‘I’ve Been An Awful Good Girl’, ‘Think Of All The Fellas That I Haven’t Kissed’, ‘I’ve Been An Angel All Year’, and ‘Sign Your X On The Line’ to show you all. Missi’s holiday collection of 8 beautiful colors are all inspired by the song ‘Santa Baby’ (you can listen to the video above), with each polish named after a line in the song. This has always been one of my very favorite Christmas songs, so I was very excited when this collection was announced. I think the polishes all match their lines in the song very well! First I have ‘I’ve Been An Awful Good Girl‘. I think this was my favorite of the bunch! It’s a beautiful white crelly polish filled with shimmer and various sizes of purple and pink glitter. It screams ‘girly’! The photos show 2 coats plus 1 coat of Color Club’s fast dry topcoat. It applied wondefully, no dabbing or glitter placement needed. Next I have ‘Think of All The Fellas That I Haven’t Kissed’. This one is a gorgeous glitter bomb, filled to the brim with fine and ultrafine glitter in purple, blue, and teal. Definitely more ‘boy’ colors while still remaining sparkly and feminine! This is 3 thin coats with 1 coat of fast dry topcoat. Coverage and application was excellent again! Next up is ‘I’ve Been An Angel All Year’! This pretty polish is another white crelly, filled with fine matte white glitter, shimmer, silver and blue glitter. It definitely gives an angelic appearance! It also reminds me of freshly fallen snow. This 2 coats with 1 coat of topcoat. Like the other 2, application was a breeze! Last but not least, I have ‘Sign Your ‘X’ On The Line‘! This one is a beautiful topcoat, filled with golden flakes and silver shreds! The photos show just 1 coat over Cult Nails Nevermore. Like the others, the application was wonderful. My only complaint is that I had to fish a little for some of the silver shreds to make everything look even, but that’s a minor issue. On most nails there were plenty! Aren’t these just so pretty? You can check out all of the awesome colors in the Santa Baby collection at Different Dimensions Etsy store, and keep up with sales and upcoming collections on their Facebook page. Be sure to check it out! Hey all! I haven’t had a chance to take pictures recently, but then I realized- I had a handful of older ones I’d never shown off. Rory is part of the ‘Surf’ side of the collection- the shimmery colors. The ‘Beach’ side of the collection is all beautiful creams that correspond to the Surf shades. These photos are all 2 coats of Zoya Rory in sunlight. Such a pretty barbie pink with a gorgeous silver shimmer! Today I have some more beautiful Christmas colors to show you all! If anyone looks at my stash list, you’ll probably be able to quickly guess some of my favorite brands. 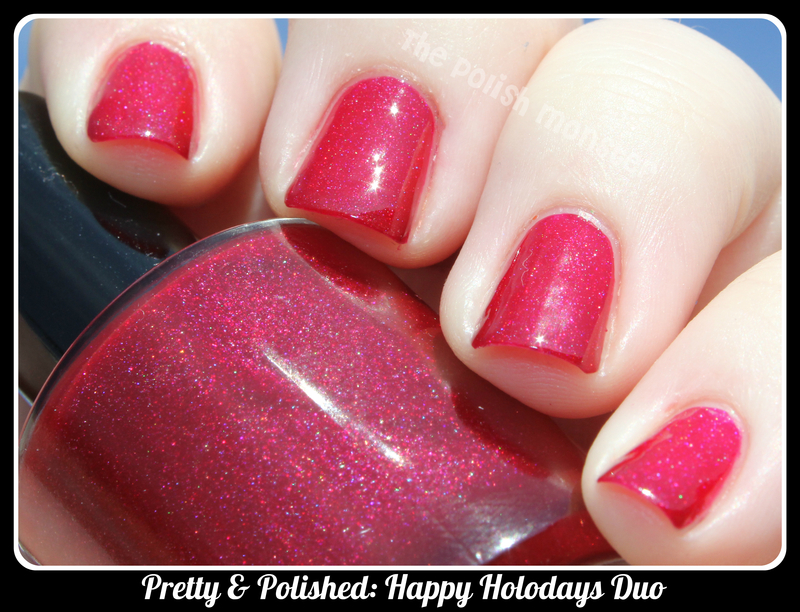 Currently Pretty & Polished holds the title for my most numerous indie line- so I am extremely excited to show off 3 of the Christmas colors! All of the new Christmas colors will be available for sale THIS FRIDAY (11/9) at Pretty & Polished’s Etsy store! First up, I have the Happy Holodays Duo! This set contains a beautiful berry colored polish filled with fine holographic glitter, and a stunning red and green glitter polish. I really, really love this polish! It’s a bit more vampy than my photos are showing- that’s always one of the downsides to taking photos outdoors to show off the holographic glitter! Just look at that sparkle! This is a very subdued holographic color- it’s not in your face and flashy, but very subtle and adds a beautiful sparkle to a beautiful holiday color. The application on this polish was wonderful, as I’ve come to expect from Pretty & Polished. This was almost a 1 coat color- there was just the tiniest hint of visible nail line with only 1 coat. Two coats makes for perfect coverage! Everything went on smoothly and wonderfully. Now for the second half of the duo! The second half of the Happy Holodays Duo is a gorgeous glitter polish, filled with various sizes of red, green and lime glitter! 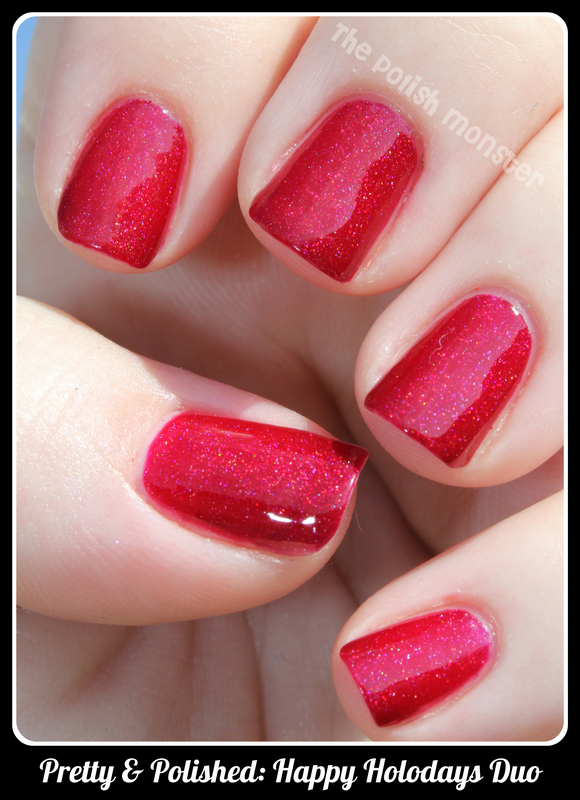 This color looks beautiful on top of the berry polish- it keeps with the holiday theme, but the berry red is a different enough shade from the glitter that the glitter doesn’t get lost on top of it. It definitely should be noted that this polish also applied beautifully. Sometimes, with glitter bombs, you have a lot of pulling issues- when you brush the polish on, it will drag from the back of the nail and clump more towards the front. Of course that inevitably happened a little bit, but for the most part it was not an issue- one brush stroke, and the glitter was evenly dispersed on my nail. No dabbing for placement needed! These first two photos show 1 coat of glitter. This photo shows off 2 coats of glitter. As you can see, you can easily wear this half of the duo on it’s own for a full glitter bomb if you wanted! The only place the base color was peaking through was around the bottom edges. Last but not least, is Xmas Wreath! 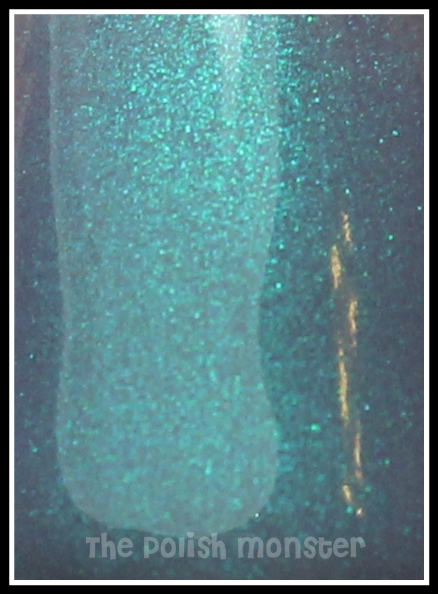 This polish is a beautiful shimmering evergreen color filled with red and gold glitter and green shreds. These photos show 2 coats of Xmas Wreath. Application was great, with 2 coats you had a good amount of glitter peaking through and perfect coverage. The base color of this one is a bit more opaque, so some of the glitters get a tiny bit covered up on the nail- particularly the shreds. Which definitely adds to the ‘wreath’ feeling! As I mentioned before, all of Pretty & Polished’s Christmas polishes, including these 3, will be on sale this Friday, 11/9, at her Etsy store! There is a lot of beautiful colors being released this week- be sure to keep up to date on all of the recent additions and stock times by liking Pretty & Polished’s Facebook page, and by following her blog! These polishes were sent to me for an honest review.